Maggie Gosselin’s twin sons have identified a problem. Unlike most 7-year-olds, Ethan and Austin decided to seek a solution. They went to see the mayor. 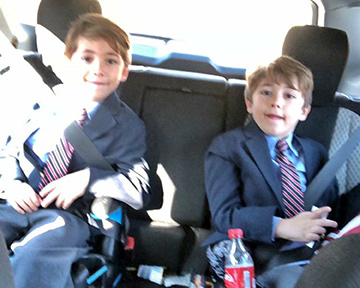 Gosselin took the boys, dressed in their best suits, on Saturday, Nov. 10, to have a talk with Homewood Mayor Richard Hofeld, who said later that he was charmed and impressed by the youngsters and their initiative. Unfortunately, he didn’t have an easy or immediate solution to their problem. As is almost always the case, the situation is complicated. Hofeld said the boys were most interested in seeing a Sky Zone, or something similar, open here. The trampoline park has four locations in the area. The nearest is in Orland Park. The best location for a business like that is the former Brunswick Zone bowling alley at 3043 W. 183rd St. It has plenty of space to develop an entertainment facility. It also has plenty of impediments, which is why it has remained vacant since the bowling alley closed in January 2015. Homewood Economic Development Director Angela Mesaros said the village is eager to see the site redeveloped, but so far progress has been hard to come by. She said the tax liability of the property was purchased by a finance firm, PFS Financial 1 LLC. The village has not had any contact with the company, she said. The village often seeks help untangling complex ownership and tax liability problems through a land bank. However, Mesaros said this property doesn’t qualify for land bank assistance. The land bank will help redevelop properties that are unsafe, abandoned or delinquent in taxes or village bills for at least two years, she said. 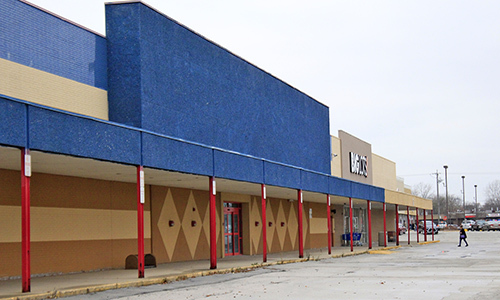 Because the tax liability has been purchased and there remains a viable business (Big Lots) operating in a portion of the building, the former Brunswick Zone doesn’t qualify. That makes this knot a particularly difficult one to untangle. Village officials generally are tenacious about these problems. The former Bogart’s Charhouse was similarly encumbered, but after several years of work and the help of a land bank, the village was able to acquire the property and is making progress toward redeveloping the site. As intractable as these property problems can seem, they can be solved. If any community can solve the Gosselin boys’ problem, H-F can. Baseball fans experience an annual period of misery known as Between Seasons. After the last out in the World Series but before pitchers and catchers report to spring training, well, it’s hard to care much about life. Farmers Market fans are in the same dreary doldrum. Between the last summer market on Oct. 13 and the first winter market set for the last Saturday in January, we just have to muddle through as best we can. I talked with Market Manager Kate Duff on the last day. She said the market had a couple of new vendors that were popular, including T’s Cheese, providing prepared vegan foods, and Armstrong Farms that provided organic produce. This was the first year the live music at the market had a sponsor, too. The support from La Voute Bar + Bistro enabled the market to provide two sets by local musicians every Saturday and one set on Wednesday nights. The biggest news from the summer season, though, was the exploding popularity of the Wednesday evening market that was packed. The Wednesday evening market also had a popular vegan food booth, Sunshine Kitchens. Their dishes were so popular they sold out early some weeks, so fans made certain to enjoy the offerings by lining up early. A belated happy birthday to Rabid Brewing, Homewood’s first craft brewery that marked a year in business in October. I talked with owners Raiye Rosado and Tobias Cichon periodically throughout the development of the business and heard about the various challenges they faced. They persevered through one major problem after another and remained undaunted. When one serious glitch left them without a general contractor, Rosado took over so she could oversee the completion of the build-out at 17759 Bretz Dr. Since the brewery and taproom opened, Rabid Brewing has become a fixture at local events, from the Homewood Farmers Market to Flossmoor Community Church fundraisers to the Homewood Arts Council’s first 0.3K run. I hope this is the first of many birthdays to come. On page 25 in the November edition, Tom Shepherd’s name was misspelled. The Chronicle apologizes for the error.